This popular combo provides you assurance on both fronts! 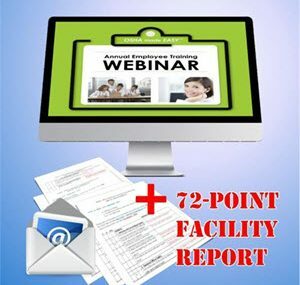 72-Point OSHA Safety Facility Inspection & Report completed over the phone; Results emailed to you instantly. Anything on your report marked in “RED” becomes your OSHA homework and needs correction. A Dental Enhancement OSHA Expert will be on-call to answer any of your OSHA questions or concerns as you rectify your OSHA homework. 50- Minute OSHA Annual Employee Training Webinar via Go-to-Meeting™: Includes HIPAA Omnibus Rule & GHS (Global Harmonization System) overview. (Downloadable video copy available for $39. Save to desktop to use again and again!) Train at your leisure! Convenient to use when adding new team members. Annual Employee Training Certification and printable sign-off sheet as proof-of-training & Handout too. 20 minute “OSHA Review” Phone Session to debrief on the materials with your office’s key contact person. A Dental Enhancements OSHA Training Specialist will contact you within 48 hours via email with your Go-To-Meeting™ Webinar invitation. Be sure to include your phone number & email address with your purchase info. Since most of our OSHA / HIPAA products are customized, we cannot effectively reuse these materials. Therefore, we do not credit returns but, we will work with you to correct or rectify any challenges you have with any of our products. Our Customized products are replaceable without refund.